Renowned for his Inspector McLean series, author James Oswald has challenged himself with creating a female protagonist in the shape of DC Constance Fairchild. As part of an undercover team, headed by DI Peter Copperthwaite, she is summoned to the office that’s acting as a front for the team by the aforementioned DI. When she arrives, someone has tried to set the office on fire, her boss has been beaten up and executed with a shot to the head. With the operation a complete washout, Constance finds herself on suspension and with strict instructions from Det Supt Bailey to stay well away from the case. But she can’t help but go to her dead colleague’s house and take a look around, only to be caught in the act. When her relationship with the murdered DI is called into question and Professional Standards put her under the microscope, it looks like Constance is being set up to take the fall. When someone puts a couple of rounds through her bed, she gets the message and hears through an informant that a contract has been placed on her head. A chance meeting with an old school friend, Charlotte DeVilliers, finds her telling Constance about her younger sister, Isobel, who seems to have dropped off the map in the last few days. Our suspended protagonist is happy to help try and find her, and off they go visiting her old school, then the village where her family and the Devilliers live in Northampton. It’s soon obvious to Constance that she’s being tracked and as the trail leads north of the border to Dundee, we’re plunged into a frantically paced pursuit, as Constance gets closer to the truth. Whilst those determined to stop her, do everything in their (not inconsiderable) power to stop her. Throw in a one-eared cat, goat curry, a loving aunt, estranged parents, a very determined central character, a dark secret from the past and you have an excellent crime thriller, for what I trust will be a new series for Constance. 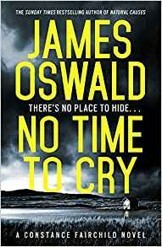 James Oswald’s books have always been a pleasure to read and he’s produced a fully fledged female lead without missing a beat.